Panna cotta is one of the desserts in my list that I wanted to try for a long time. When this was part of our Pastry, Hot and Cold Desserts module in TAFE, it was a welcome surprise. Its easy and so pretty when finished. A few minutes heating the cream, chilling and voila - a simply and elegant dessert worthy of praise. My hubby who is not-a-dessert-person had a spoonful of this and then another plate. Hang on. That's dessert! Not a meal! Hahaha! In short, he loved it. And so did the girls. Silky and creamy panna cotta paired with that sweet and tangy raspberry sauce. Beyond delicious! I tell you. It looks really fancy on a white plate. Lavishly elegant I must say - just like poached pears in red wine desserts. Maybe its not as smooth as restaurant versions or the ones you'd see in recipe books but looks are always deceiving. This dish is making its way to this month's Sweet Adventures Blog Hop themed Berry Nice to Meet You hosted by Christina from The Hungry Australian. Before I settled on this dessert, I had so many strawberry recipes in mind and with the good supply of strawberries from QLD it was just the best option. But we had frozen raspberries waiting for some love so this happened. And it was a good choice. Something different in our dessert repertoire which does not involve using the oven. This recipe is adapted from the 2011 edition of Essential Desserts - More than 200 step-step-Recipes by Murdoch Books. Lightly grease five 150ml panna cotta moulds or ramekin moulds with canola spray. Place 60ml of the cream in a small bowl then sprinkle the gelatin powder on top and leave to rest. Pour the remaining cream in a small saucepan with the vanilla bean and sugar and put on low heat while gently stirring. Heat through until the sugar has dissolved. Do not boil. Remove from heat and using a hand whisk, mix the gelatin-cream mixture to into the warm incorporate. Pour into the prepared moulds and chill for 2 hours or until set. Prepare the ruby sauce while the panna cotta is chilling. In a small saucepan, combine the water and sugar and put on medium heat until the sugar was dissolved. Add the cinnamon stick and simmer on low heat for 5 minutes. Add the raspberries and wine, on medium heat, boil for 5 minutes. Remove from heat. Take out the cinnamon stick and strain the sauce through a strainer/sieve. Using a spoon, push the raspberries through the sieve or strainer to drain all that juice and all you're left with are the seeds. Discard the seeds. Let cool. Then chill in the refrigerator. 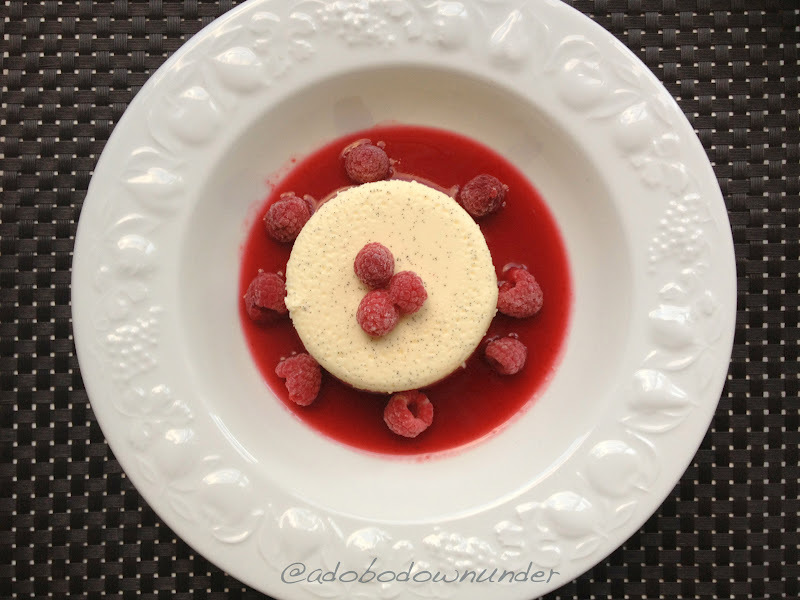 Serve as a sauce with the panna cotta and garnish with more raspberries. How about you? Do you have any food dishes that you've been putting off to try? Why not try and make this one? It will surely impress. And now that you've met this berry dessert, go and hop on to the other berry-licious creations. And while you're at it, why not join in the fun and have a go at making someone's day berry-full. I've been waiting for this post since seeing it in your Insta feed. Looks so creamy and decadent with the specks of vanilla beans. And the sauce looks and sounds amazing too. Great recipe Anna! Thanks Nic. Indeed a delicious dessert. Don't know why I've never tried making it at home. Thanks to SABH for all these new sweet treats that I'm rediscovering. Mmmmm I love a good vanilla panacotta - the perfect excuse for eating a whole heap of cream! The ruby red sauce with merlot in it sounds a treat too. Nothing better than ruby red fruits and a red fruit flavoured wine. You got that right Shez! Thanks lovely! Wow, lovely panna cotta you've made here! I've never tried making it at home yet but now I'm inspired. Thanks for joining this hop! Hey that looks really yummy! :) It's hard to make panna cotta though, do you have any tips on how to get the right consistency? Thanks Andy. They are yummy but a bit tricky when adding the cream and gelatin together. We had this last term in TAFE and chef said to be careful when mixing the gelatin and cream together. The cream mixture should not be too hot or it will totally destroy the gelling agent in the gelatin and you can end up with panna cotta that's too watery. Thanks for stopping by. Thanks Tania. They are the perfect match aren't they. White and red. Love. Mmmmm looked delicious! Panna cotta was one of the things I thought of trying for the hop but went with tried and tested ice cream! 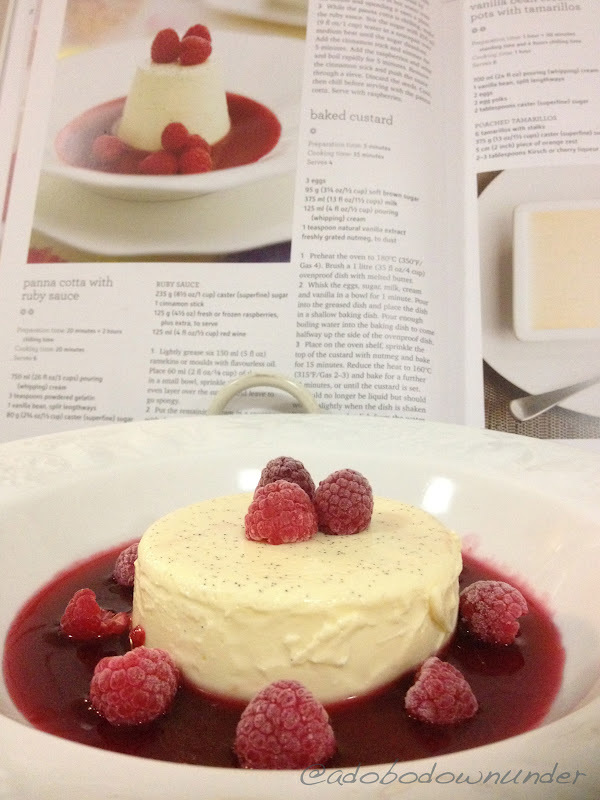 I've only made panna cotta once, but as you say it seemed quite a lot easier than I thought it would be and turned out beautifully - just like yours! Thanks Michelle! It was a welcome surprise. And I'm definitely hooked!